"For example, if a planet has a ring system, Like Saturn's, it could result in tiny dips just before and right after the main brightness drop due to the planet itself. In fact, the rings of Uranus were discovered serendipitously in a manner similar to this. Just by chance, Uranus was to line up exactly with a fairly bright star on March 10, 1977. Three astronomers took observations during this "occultation" with a telescope on a plane called the Kuiper Airborne Observatory, hoping to study the planet's atmosphere as some of the distant star's light passed through it on the way to us. 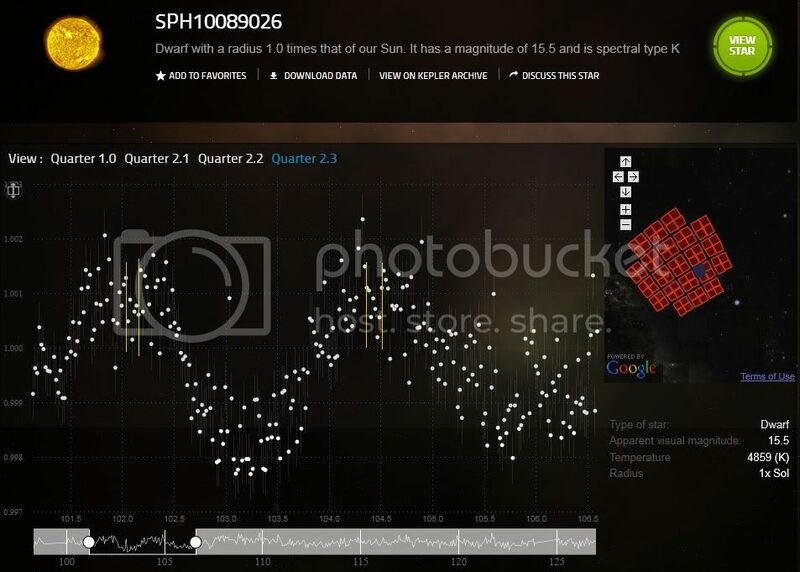 When they analyzed the data later, the researches noticed that the star had disappeared briefly from view five times before and after the planet eclipsed it. The reason, they deduced, was the presence of narrow rings around Uranus. If the star had dimmed only on one side of the main eclipse, a moon rather than a ring could have been responsible." I have highlighted the areas that look to me to be exactly what Jayawardhana described. The purpose of this thread is to raise awareness of the possibility of finding rings (and maybe even moons) around large (and I emphasize LARGE) exoplanets, and to hopefully find some confirmable instances. If you see some, post 'em here. An excellent idea for a thread! Yes, so what about this candidate: http://www.planethunters.org/sources/SPH10037683 ? 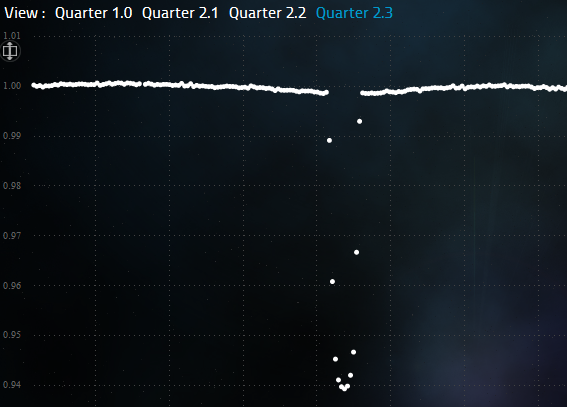 Just about 2.2 days before beginning of the transit and 2.2 days after the end there is an additional very small drop. > Yes, so what about this candidate: http://www.planethunters.org/sources/SPH10037683 ? > Just about 2.2 days before beginning of the transit and 2.2 days after the end there is an additional very small drop. I remember bringing attention to this guy - it has that perfectly huge transit that we can't figure out. But I'd think 2.2 days is too far away for any rings or moons. Another interesting thing is that this star should have had fp16 because it's imaged by CCD module 2.3. Even the Examine Star map shows the same grid as the other fp16 stars. 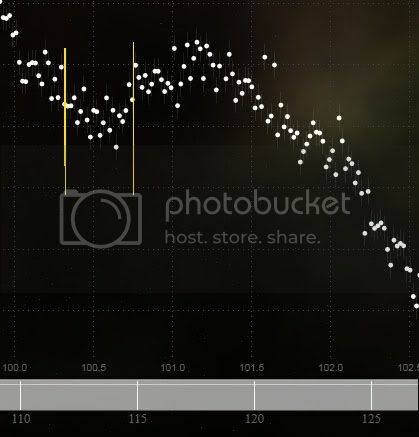 This one (mega-planet or sub-brown-dwarf)(http://talk.planethunters.org/objects/APH22065220) appears to have a "lip" of gradually decreasing / increasing luminosity for about a day to either side of of the transit. I took this as a likely effect of a very thick atmosphere surrounding the world, but perhaps a ring is a more probable explanation. > > Yes, so what about this candidate: http://www.planethunters.org/sources/SPH10037683 ? > > Just about 2.2 days before beginning of the transit and 2.2 days after the end there is an additional very small drop. > I remember bringing attention to this guy - it has that perfectly huge transit that we can't figure out. But I'd think 2.2 days is too far away for any rings or moons. > Another interesting thing is that this star should have had fp16 because it's imaged by CCD module 2.3. Even the Examine Star map shows the same grid as the other fp16 stars. Yeah, 2.2 days seems a tad long. 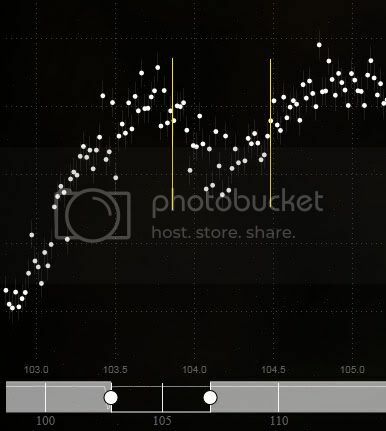 However, if you zoom way in, there is a VERY tiny disruption on each end of the transit @ ~106.7 and ~108.0. Nothing you'd ever mark as a planet transit... just 2-3 pixels dropped by 1 pixel, but I suspect that some rings can be kind of ephemeral. 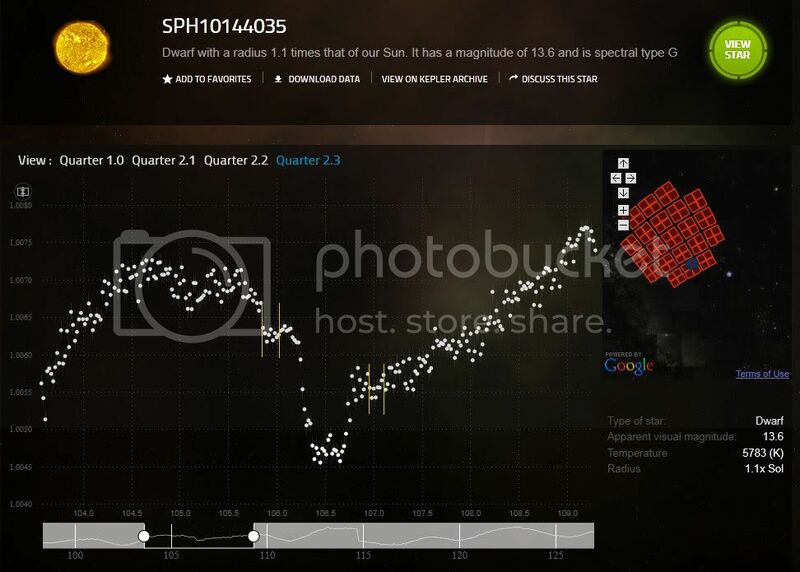 > This one (mega-planet or sub-brown-dwarf)(http://talk.planethunters.org/objects/APH22065220) appears to have a "lip" of gradually decreasing / increasing luminosity for about a day to either side of of the transit. I took this as a likely effect of a very thick atmosphere surrounding the world, but perhaps a ring is a more probable explanation. Here's what I'm seeing on each end of the transit. First is just before the transit. Second, just after. There may be more, which would probably indicate multiple rings. Good idea to open that discussion, I will be more carefull! Yes, Gerald, that is very interesting.